That piety so characteristic of all levels of society in Holy Russia. was rapidly evaporating from the nineteenth century high society intelligentsia when God raised up from its very midst a true ascetic and Church writer, Bishop Ignatius Brianchaninov. In him was combined a rare eloquence of style and a profound understanding of the Christian life of struggle through which he was able to inspire many souls, blinded by Western "enlightened" ideas, to return to the saving enclosure of the Church. Bishop Ignatius was a prolific writer best known in the English-speaking Orthodox world for his masterful work, The Arena, in which he skilifully instructs those engaged in the arena of spiritual combat-out of which he himself emerged such a glorious victor. A chapter from Pr. Nicholas Deputatov's book, The Awareness of God, contains a brief life of Bishop Ignatius, together with short selections from his writings. This has been translated below for the edification and inspiration of those struggling in the arena of unseen warfare today. Born into a noble family of wealthy landowners, Bishop Ignatius was sent as a youth to the St. Petersburg Military School, a renowned institution which enjoyed the patronage of Tsar Nicholas I. He was a brilliant student, but his heart was not in his studies. Only a few years after graduation as a commissioned engineer, he fell seriously ill and used this as an excuse to request a discharge from the army. Drawn to religion from an early age, he was now able to fulfill his childhood dream of entering upon the monastic life. He spent four years in various monasteries as a novice, forming a close bond with Elder Leonid of Optina, before being tonsured in a small monastery near his native Vologda and ordained to the priesthood soon thereafter. "I still like you; you are indebted to me for the education I gave you and for my love toward you. You did not wish to serve me in the position I had intended but chose instead a path of your own desires; in that case, repay me your debt on~ this path. I am giving you the St. Sergius Hermitage. It is my wish that you would live there and transform it into an exemplary monastery for the whole of Russia." The debt to the Tsar was paid in full. Taking charge of the hermitage which was located on the outskirts of St. Petersburg, the young hieromonk soon built up a monastery with three churches, large living quarters, and a great number of monks. After twenty four years as Superior of St. Sergius Hermitage, in 1857 he was consecrated Bishop of the Caucasus and the Black Sea. Only four years later, however, he retired and devoted the rest of his life to compiling writings on the ascetic life and in editing and preparing for publication various articles he had written over the years. In addition he conducted an extensive correspondence with his spiritual children. He died in 1867 in the seclusion he had desired since his youth. A refined adornment of Orthodox monasticism, Bishop Ignatius taught about the monastic life not only in his ascetical-theological writings, but by his very life which presented a wondrous picture of self-denial and struggle with sins, sorrows, and sicknesses. His numerous written works include Experience in Ascetic Life (5 Volumes) Patericon, Homily on Death; and others. 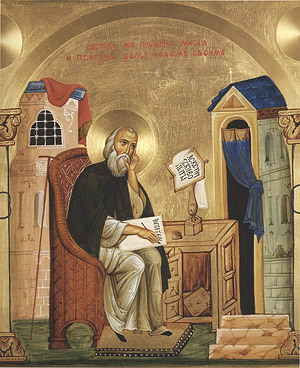 The hierarch himself acknowledged: "The source of my writings is to be found in the Fathers; they belong to the Fathers of the Orthodox Church…"
Experiences from the Ascetic Life is a work of singular importance. "This is not my work," affirms the hierarch, «"hat is why I am able to talk about it so freely. I was only the instrument of God's mercy towards contemporary Orthodox Christians in desperate need of a clear exposition of the principles of Christian struggle"… Experiences may be read in place of the Philoka1ia as being more understandable. "I spent my entire life in sickness and sorrows, but without sorrows, how can one be saved? Illness is sent by God in place of and to make up for the deficiency of our struggles. I see that my ill health is a gift of God -His epitimia, His mercy…"
"What is death?-the age with which our true life begins. A man should not despair, no matter how great his sins, for a man is not saved by his good deeds, but by his faith in Christ the Saviour; only his deeds should manifest his faith.. Just think that the great Apostle Peter himself wept bitterly…"
"Prayer chases away foul thoughts and fills us with jubilation… One mustn't give way to despondency. On the contrary, one must thank God for sorrows as a Sign of being chosen for eternal blessedness. Not only does gratitude deaden the sharp sting of grief, it fills the heart of one who is thankful with a heavenly, spiritual solace. Nowhere can one find such solace as in patience which is born of humility. Humility consists in considering ourselves worthy of sorrows which God's Providence allows to visit us' Sorrows were always the lot of those on the path to salvation…"
"The world lies in a state of spiritual deception and manifests an affinity for those in the same state. But it despises and rejects those who serve Truth…"
"Knowing the Saviour and thus acquiring eternal blessedness is man's primary happiness on earth, and his only treasure..,"
"Faster and faster time passes, and the hour of our entrance into eternity draws nigh. Make use of your days on earth to prepare for this. Such preparation dispels temporal sorrows and brings consolation, thereby indicating that this preparation is indeed a preparation for blessedness…"
"One must never, for any reason, become despondent, for we are carried in the hands of God's Providence. Our concern is to be true to the Lord. And the Lord purposely reveals the weaknesses of him to whom He wishes to grant His gift of discernment. For the beginning of a soul's enlightenment is the perception of its own sins and its insignificance…"
"Stop making prostrations for awhile; illness has taken their place. But do not stop praying with heartfelt compunction. " "May the Lord teach you humility. the source of all calm. From humility peace and quiet flow into the heart. If we are handed the cup of suffering, let us accept it as the cup of salvation, as a pledge of eternal joy. He who refuses sorrows, rejects also salvation God allows the devil to strike us for the sake of our salvation and humility." "My sincere desire is to end my days somewhere in solitude and anonymity, in spiritual vigilance and repentance. One should not deceive oneself with false expectations of a long earthly life… Everything passes, both the good and the bad, and neither humans nor demons can overcome that which God does not allow." All of his letters and essays in Experiences are indeed profoundly edifying and moving. They are written from the heart and are penetrated by true faith and humble piety which distinguished this most highly revered author throughout his entire life. Have mercy., O Lord, on this zealous writer-ascetic of blessed memory, and through him have mercy also upon us who are tossed about on waves of sin in the stormy sea of life. "Have mercy., O Lord, on this zealous writer-ascetic of blessed memory,..."
Bishop Ignatius was glorified (canonized) as a saint by the Local Council of the Russian Orthodox Church in 1988. Is it then right to have a supplication like the above? Holy Father Ignatius pray to God for us.